For more information about templating and how to modify the default templates of the controls from the UI for Silverlight suite read the common topics on this matter. Content - is of type ContentControl and hosts the RadBusyIndicator's content. Overlay - is of type Rectangle and represents the rectangle overlaying the content while the RadBusyIndicator is active. Indicator - hosts the indicator control and is of type Border. ProgressBar - represents the RadProgressBar visible while the RadBusyIndicator is active. 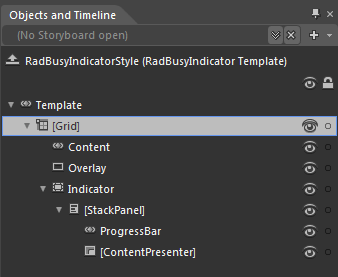 [ContentPresenter] - represents the content shown underneath the RadProgressBar and is of type ContentPresenter. [Grid] - represents the host container for the RadProgressBar control. 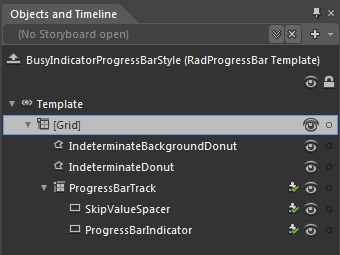 IndeterminateBackgroundDonut - represents the outer background donut visible while the RadProgressBar is active and is of type Path. IndeterminateDonut - represents the rolling background Path visible while the RadProgressBar is active. ProgressBarTrack - represents a specific PART element of type Grid hosting the indicator's content. SkipValueSpacer - is of type Rectangle and is also a PART element. ProgressBarIndicator- is a PART element of type Rectangle and hosts the innermost circle of the RadProgressBar's indicator.